Morphological changes have been reported to occur in cells exposed to microgravity, even if quantitative (i.e., fractal) analysis has been never performed on cell shape. We investigated cell shape as well as cytoskeleton modifications induced by simulated microgravity on murine osteoblasts (MC3T3-E1) growing in vitro by means of fractal analysis. On average, after 48–72 h of exposition to microgravity, osteoblasts display significant changes in shape profile, recovering a more rounded phenotype characterized by larger surface area than controls. More specifically, microgravity enacted the emergence of two distinct morphological phenotypes, one of which characterized by an increase in membrane fractal values, surface area, and roundness. Moreover, osteoblasts exposed to microgravity undergo significant functional changes (inhibited growth proliferation, increased apoptosis, β1-integrin decrease, impaired Akt and Erk phosphorylation) that could likely concur in explaining the observed alteration in bone structure experienced by astronauts. 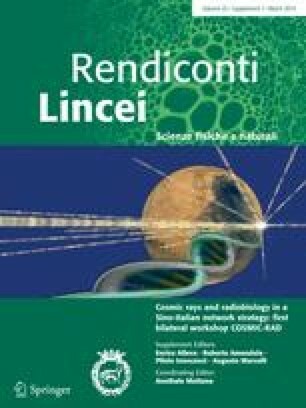 This contribution is the written, peer-reviewed version of a paper presented at the workshop: “Cosmic Rays and Radiobiology in a Sino-Italy Network Strategy: First Bilateral Workshop COSMIC-RAD” held at Institute of Modern Physics, Chinese Academic of Science, in Lanzhou, Gansu Province, China on September 3–4 2012. This work was funded by ASI (Italian Space Agency), LIGRA Program.